Breast cancer is a tough illness and is touching more and more lives every day. During the battle, it can be difficult to know how to help. Taking a meal is one way to help both the patient and the surrounding family. One of the best resources I found for recipe ideas and advice for helping my friend when she battled cancer is Cooking For Your Life. This website allows you to search based on the restrictions that your loved one may be facing. You should also check out their article 10 Tips For Taking Meals To Friends With Cancer to start. 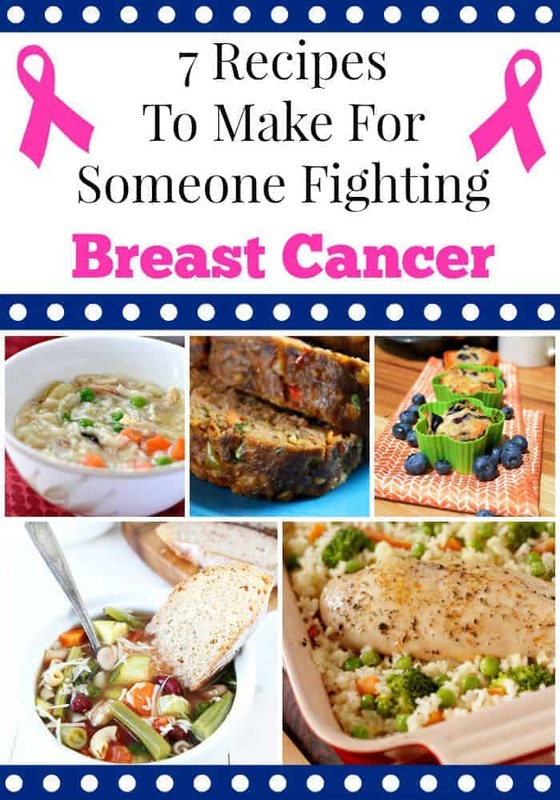 In honor of Breast Cancer month, I have rounded up some healthy recipes that are good choices to take to a friend or loved one who is battling cancer. Please keep in mind the dietary restrictions of the person who you are bringing the meal to. Many of these recipes will also work if you are taking a meal to someone battling other kinds of illness. Here is a great option for a nice easy side salad you could bring as part of a meal. Check out the Sesame Lentil Salad. Research currently suggests diets rich in legumes like lentils can help deter cancer. This salad will store for a few days, and does not need to be heated. If you are unsure about the sesame oil, you could easily substitute olive oil. This quick and easy Jenny’s Best Meatloaf from Jenny Can Cook is the perfect feature for your care package. Meatloaf not only makes a lovely main dish, it also freezes well and makes a delicious sandwich. Choose extra lean meat for this dish. Comfort food warms the soul when you are ill. Do not miss The Best Chicken Noodle Soup recipe. This delicious recipe can easily be portioned and is comforting like a fuzzy blanket. I would add a few extra veggies such as zucchini, peas, carrots or celery. To make this freezer friendly, substitute cooked brown rice for noodles. I always try to throw something that is an easy snack to grab and go in when I bring someone a meal. Call these Healthy Greek Yogurt Blueberry Muffins dessert and throw them into your care package. When making these, pick a plain Greek yogurt to avoid added sugar. Current research is suggesting that nutrient rich blueberries can possibly help slow down tumor growth. A minestrone soup is one of my favorites when I am looking to make a hearty and healthy soup. Check out the Slow Cooker Minestrone Soup recipe over on Two Peas and Their Pod. I recommend bringing this cooked, as the smell of food cooking can trigger nausea with chemotherapy treatments. I also would omit the red pepper flakes in the recipe. Make a healthier version of a comfort classic with this Skinny Broccoli Macaroni and Cheese from The Comfort of Cooking. This tasty but healthier version can easily turn into a full meal by adding bits of low sodium ham or chicken. This is perfect for someone who needs soft or bland food. Over on SheKnows I found a fabulous Chicken, Rice and Vegetable Casserole recipe that looks easy to eat and delicious. This recipe is chock full of vegetables, and could easily be doubled for a larger portion. Readers, from your experience what are the best recipes to take to someone battling cancer? They all sound so comforting and delicious. These are wonderful suggestions for someone feeling a bit under the weather that way. This is such a different post that I think is so very helpful and informative. You really don’t see many like this out there. It is amazing how certain foods can help fight certain cancers. Everything looks easy to do. I’d love to try the baked mac and the blueberry muffins. These looks so yummy! Meatloaf is one of my favorites and Thank you for sharing. When my mother was battling breast cancer she loved when people would stop by with food. She was always so tired from chemo that the last thing she wanted to do was cook. Some very tasty and healthy ideas! My friend who is fighting breast cancer just moved away. I would totally make these for her. What a great bunch of recipes – that Minestrone looks amazing!! It’s always a blessing to help others going through trials, I love that you’re sharing that! Awesome post! You hear about the foods you are supposed to eat, but here they are in recipes, all in one post!! What a great collection of “feel-good” recipes – thanks! All of these recipes look delicious. Yummy round up! I have a friend who was recently re diagnosed. I am gonna have to make some of these for her. I just sent the link to the post to my cousin who is also my best friend. She is currently on the road back to health after being diagnosed with breast cancer. It is a tough battle to face, but she’s a fighter and is doing fine right now. Her daughter would be able to prepare these meals for her. It is quite easy to follow. These recipes are not just delicious and thoughtful, but also a way to show someone that you love them. OH how I wish others would have prepared these dishes for my dad when he was fighting cancer. This is such a great round up of recipes. So important to think about the benefits of the food, not only for comfort but health. What a great list of recipes. These all look hearty and delicious and would make anyone feel a bit better. What a super sweet roundup! Everything looks so delicious! I cant wait to try a few of these. It’s a really great idea to help out with cooking for a friend who is not feeling well and don’t have much energy. Jenny’s Best Meatloaf and Broccoli Macaroni and Cheese look really delicious! I love Chicken Noodle soup when I don’t feel well. This is a great collection of recipes! This is really helpful!!! this is sounds good and I’ll share this too into my friends. Oh that minestrone does sound good. This is a thoughtful reference list. Great recipe reference. Thanks for sharing all of them. Hope this can ease out the pain they are going though. These would be a nice reference. I’d love to make some of these for people who are currently going through the illness. It’s such a difficult challenge, I don’t want anyone to have to go through it. This is a great round up for a great cause. I worked in oncology for a few years and besides needing to eat healthy for their bodies to fight, patients don’t have the energy to cook and as Patrice said, you are also dealing with taste buds being affected- so having options available is important! The Sesame Lentil Salad would be my choice the protein and other healthy substance. Cancer Patient taste buds are sometime mess up and they may not be able to tolerate a lot. They may ask for full course meal like chicken and mac and cheese one minute and change mind often become more finicky be patient.